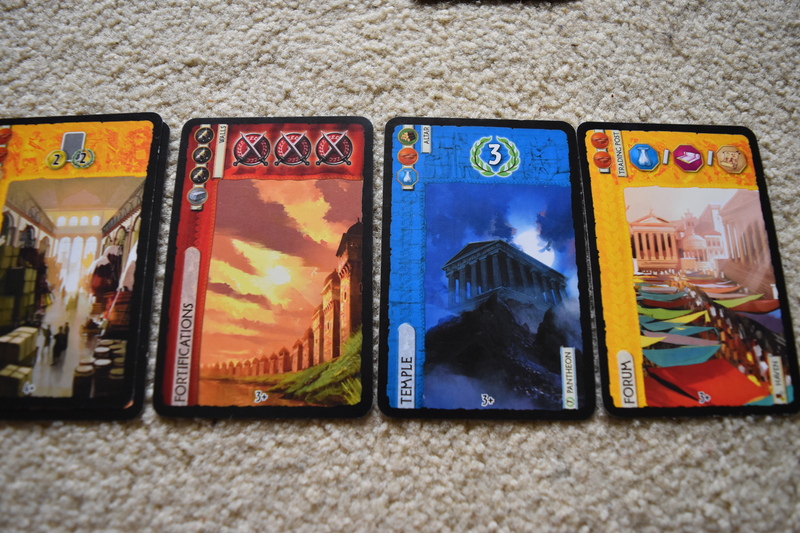 7 Wonders: For when 6 wonders aren’t quite enough but 8 seems excessive. 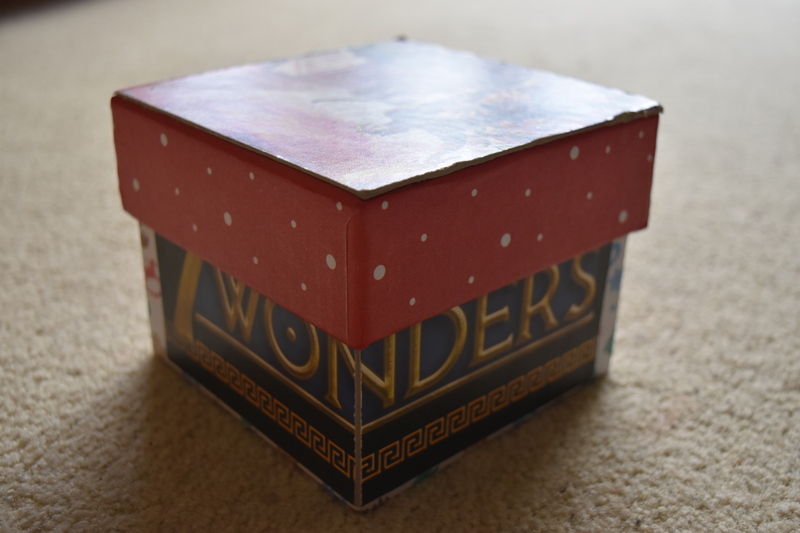 In Briony’s house, the copy of 7 Wonders was deemed too big to carry around with ease. To address this her angry spiky-haired boyfriend Pat spent a week engineering the perfect compact version, presented in a lovely Christmas gift box. The juxtaposition of the Colossus of Rhodes and the Christmas tree works beautifully. 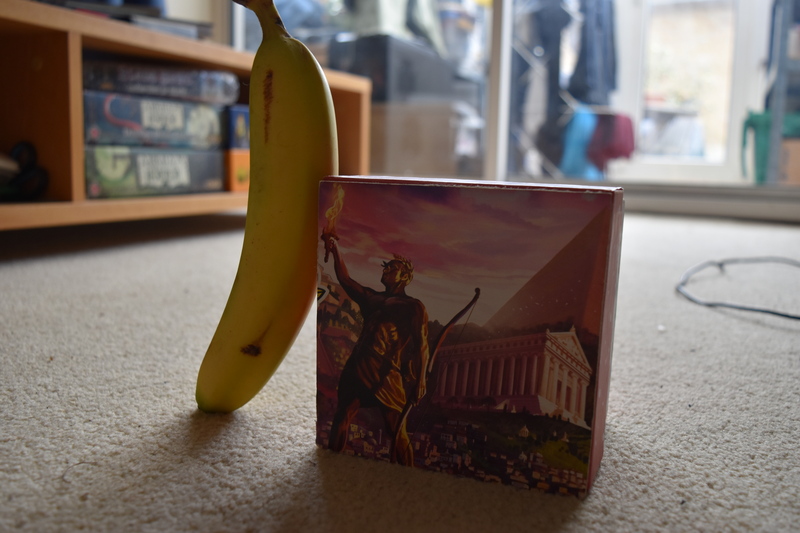 To give you some indication of exactly how much more compact it is, here is a fair trade banana for scale. Have you ever wanted to control your own Civilization? Order your serfs well paid labourers to build cool stuff that will ensure your name is never forgotten for as long as humanity walks the earth? Cry war when someone upsets you? Wait for your turn patiently while your fellow assholes can’t pick a single card in a three-hour time frame? Good. Although this may sound mightily like Civilization (of which a couple of board games actually do exist) it’s actually 7 Wonders. 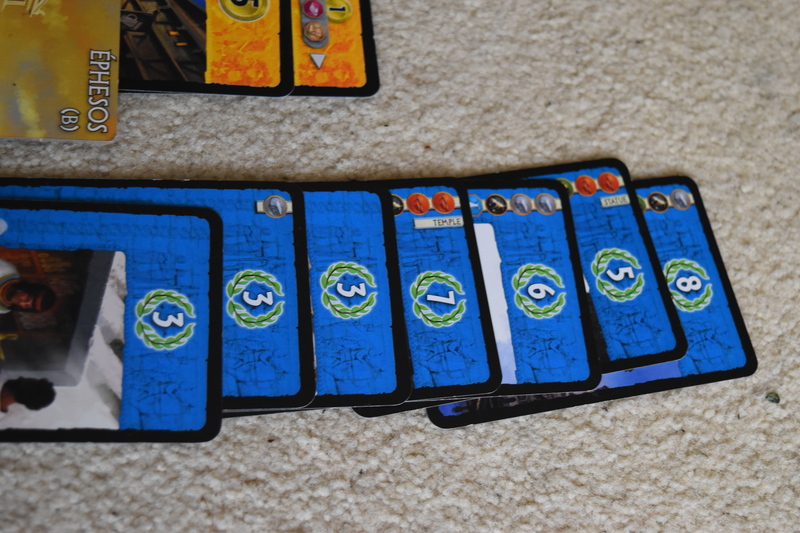 At least, this week it’s 7 wonders. Can’t speak for future weeks, it’s not like we have a schedule for these things. Unfortunately for them Briony has accrued some 400 hours playing Civilization. She promptly wiped the floor with all of them, and has only been beaten once since. 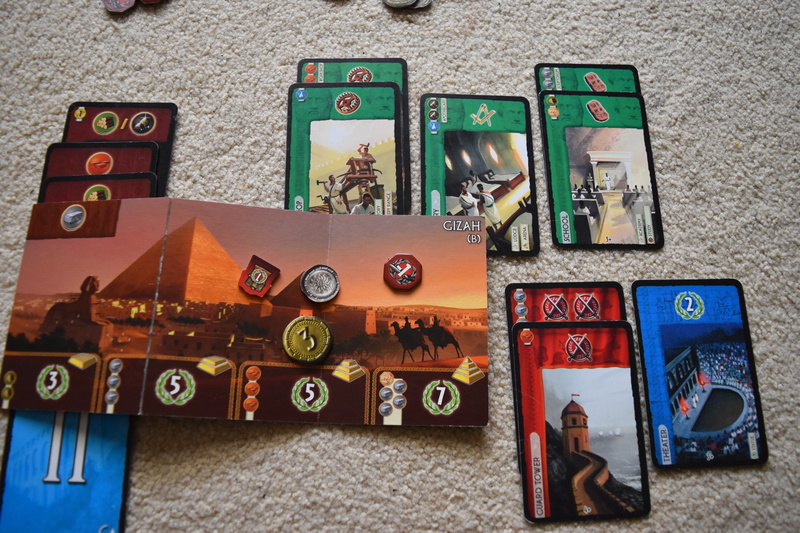 7 Wonders has remained one of her favourite games to this day. To begin, each player is assigned a great world wonder. 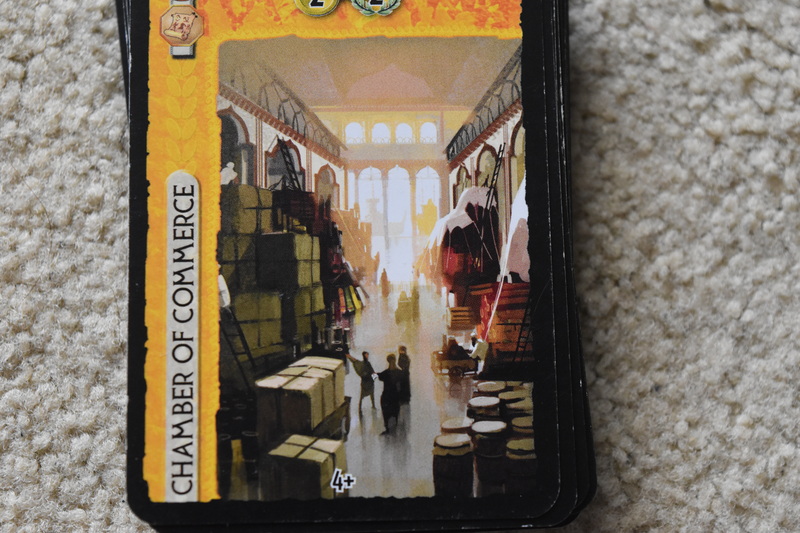 One of seven, hence the name, but you probably figured that bit out (It’s not doing the “Five Tribes” trick where there aren’t actually five players and you don’t actually get to play the five tribes, confusingly.) 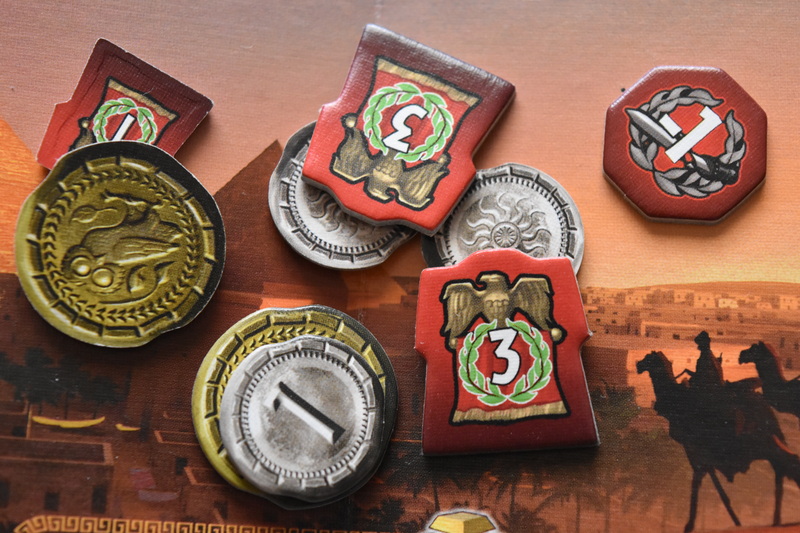 Again, if you’ve played Civilization (the non-board-game version) you’ll already recognise the wonders; maybe you might even recognise them anyway. They differ both in starting resources and the benefits they offer. 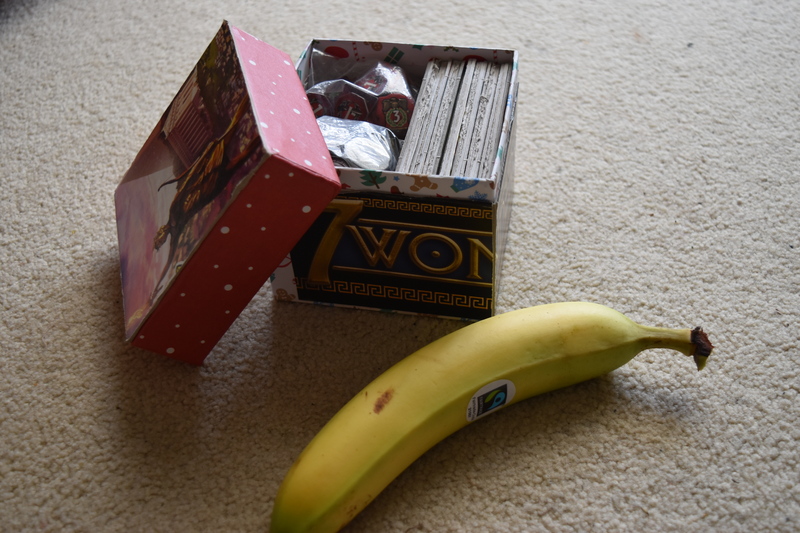 During the game you can, but are by no means obligated to, build parts of your wonder (they usually have 3 stages), and thus reap some tasty ancient treats. The game works in three eras. Each player begins with a hand of cards. You look at the cards. You eye them up, rate them out of ten, or ask for their number – whichever is the most effective way of determining a good card for you. Once everybody has selected which card they would like to build, you pass your remaining hand of cards to the player clockwise. Everyone then simultaneously places their chosen card face up and everyone has a lovely time. Simple. Now, do it again. In fact, keep doing this until you only have two cards left in your hand, then discard one and build the other. Now it the ending of the era, but it’s not particularly like the great works of writing and art suggest. It’s mainly about war, really. Each player has a mandatory fight with the player either side of them. Losing a war means losing points, winning war means winning points. Huzzah! Well done everyone, we survived an era. Best keep going. With the start of the second era a new deck of cards is brought out. 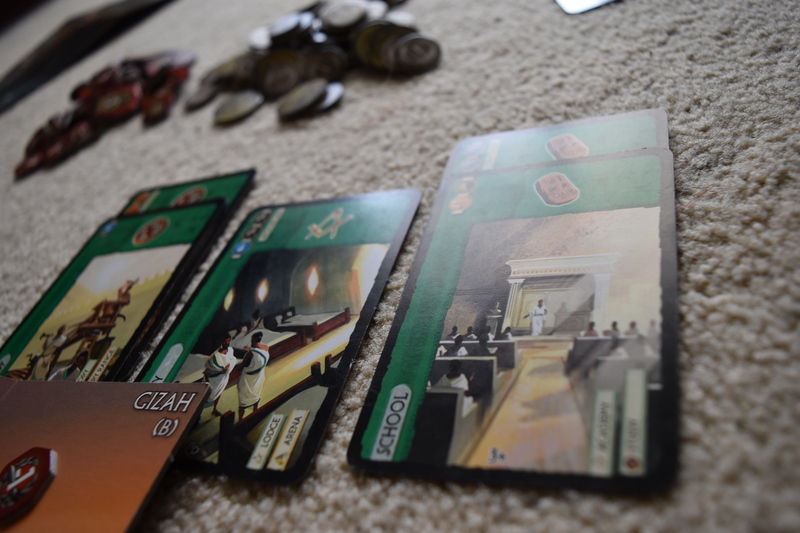 These cards build on the resources you gathered in the previous era, and will either start racking up victory points or generating larger amounts of resources. The same mechanism as before happens (start with hand, play a card, pass it on, repeat), only this time you pass the cards anti-clockwise. Bet you didn’t see that one coming! Era ends, have some war, next era begins. This mechanic where everyone picks cards at the same time means that the game is fairly simple, fast, and can sit up to seven players without significantly racking up the play time to the point where you want to claw your eyes out, or go to bed, or have a life, but you can’t because you started playing a nine-hour game. None of that in 7 Wonders. Even better, it manages to do this while still keeping a lot of delicious strategy and giving everyone some good time to think about what to do. The third and final era is where it gets particularly interesting as all the big cards come out. This is the only era where purple, or ‘victory’, cards emerge, and they have the power to significantly enhance your score if used wisely. During this era it also becomes fairly apparent which major strategy a player has gone for. And by apparent we mean ‘huh, Pete the twinkly-eyed hippie has 739 blue cards. I guess he’s collecting blue’. This is partly where this week’s Brutus rating comes in- there game does still give you a bit of wriggle room for player interaction, mostly in choosing which card you want (and therefore which card you don’t want the player to the side of you to have). If Pete is collecting blue cards then this gives you at least some reason to nab all the ones he needs before he can lay his grubby little paws on them (disclaimer: Pete actually has hands and they aren’t that grubby. Sorry Pete). It also earns an extra dagger because after each era you have to have a war with the players to your left and right either side, the poor buggers, and if you want those extra victory points you’re going to have to softly jab someone at least a little. Unless you’re Rhodes, and then you fully jab everyone. Unapologetically. Of course the problem with this, and with the fighting mechanic, is that you get a bit dicked over depending on where you decided to sit at the table. Lizzy may be a charming barrel of wit and great to sit next to sometimes (we said “may”) but this kind of game could result in everyone scrabbling to get away from her so they don’t have to put up with her meddling in their affairs for most of the game. Like all things over the great expanse of the centuries, the game will eventually come to an end. 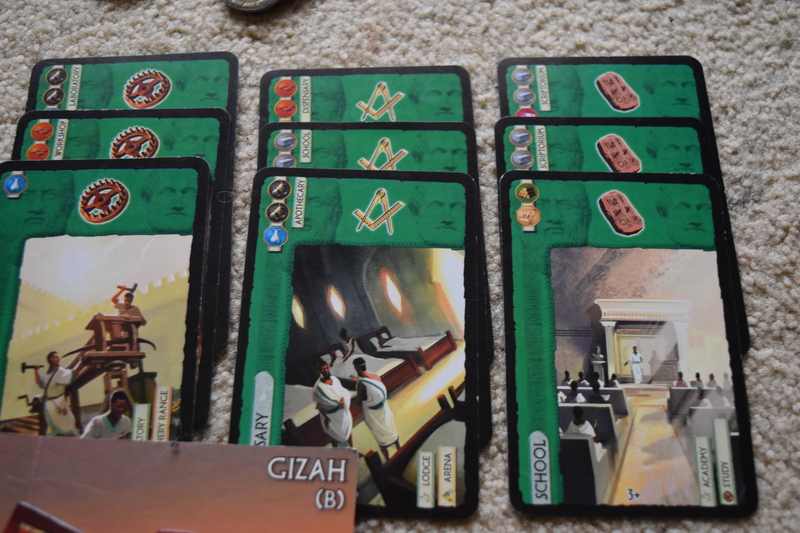 Victory is tallied up and your Civilization scores points for various card-related and wonder-related things. One thing we should mention is the trickiness with how to score science: no-one really knows. It is literally the only complex thing about the entire game. Usually there is some 7 Wonders veteran in the corner who is called upon to interpret and talk with the science cards, and then relays that information back to the rest of the group like some sort of lesser prophet. Fortunately for the rest of us mortals some genius made a thing that does it for you http://neilsutcliffe.com/7wonders/ If you can figure out how to make it work, the ‘science!’ strategy is a reliably high scorer, though easily ruined if your neighbours are paying attention to what you’re building. Had enough photos of cards yet? The game is fast in general, which makes it perfect to play several times in one evening or to get new people into gaming. 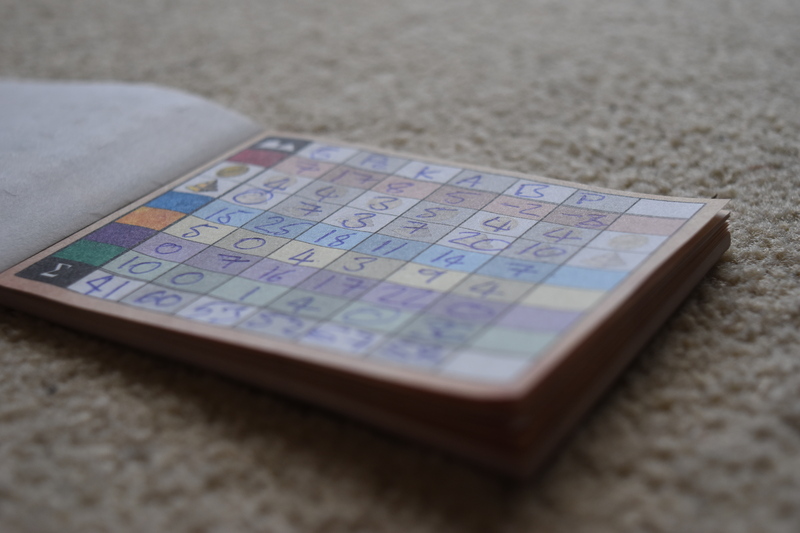 As was the case with Briony, it can make a pretty good gateway board game, as long as you take the time to explain each component and keep the card-choosing phase pretty quick. Bob actually hated (or thought she hated) this game for years, not having Briony’s Civ experience and finding game frustrating and exhausting as a board game noob. Turns out, she just had really dawdly friends who didn’t make the trading rules clear. In addition, make sure to stop and take in the art work on the cards, if that’s your cup of tea. They’re often beautifully painted scenes or buildings and they add a lot to the game design. The real winner is history. But also Briony. She’s just really good at Seven Wonders, man. This week the credit for the photos also goes to her. Good work, Bri! Just assume that it says “Briony Wins”. Convenient blurring, Briony. My score on that particular round was 67. I can provide a clearer photo should proof be needed.